Clickable Paper to Destroy QR Code, Save Print? 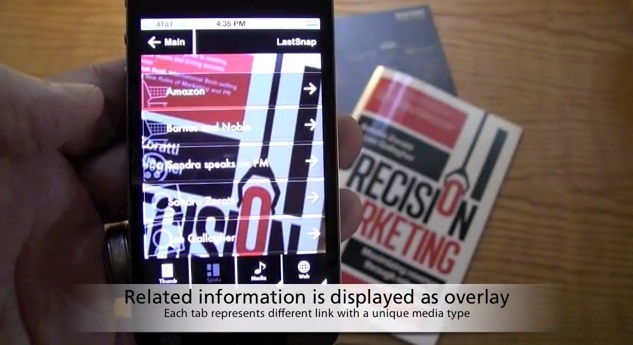 Ricoh is out with new apps for a technology called Clickable Paper. In a nutshell, it does away with the dreaded QR code by embedding hotspots directly into printed materials that are recognizable by an app. Each hotspot can point to multiple links rather than just one as it is with QR codes. And since there is no ugly QR code gumming up the works, designers will love it. Of course, people will need some sort of indication that these hotspots actually exist on the paper in the first place. The technology, out for a couple of years, is powered by Ricoh Visual Search, an image recognition solution that "establishes the relationship between information on printed paper with digital information and services on the Internet." What does this mean for marketers and publishers? It means print publishers may be given a stay of execution. It means marketers can offer a far more rich experience. It means print and online can literally be married. And, yes, we completely understand this could go the way of the Cue Cat but the technology does seem promising, not to mention user (and creator) friendly. Via.